(1) 「「支那学」の位置」 『日本思想史学』 第39号, 日本思想史学会, pp. 3-10. (2) 「訓読の自由」 『東方』 第319号, 東方書店, pp. 2-6. 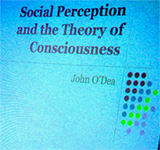 Yesterday we had a talk by Dr. John O'Dea. John is a post-doc at the University of Tokyo, and he specializes in the philosophy of mind. A caveat is in order here. I am no specialist in the philosophy of mind. Thus my report might contain some serious misunderstanding. The Society for Utopian Studies is a home for scholars across a variety of disciplines, united by their interest in the problematic of utopia. In a unique way, specialists in political science, economics, architecture, literary studies and other fields share the historical and theoretical background of this problematic. There is really something positive and genuinely utopian in the establishing of such a community of research and the city of Toronto was a perfect site for it with its wide streets, green parks, and skyscrapers.